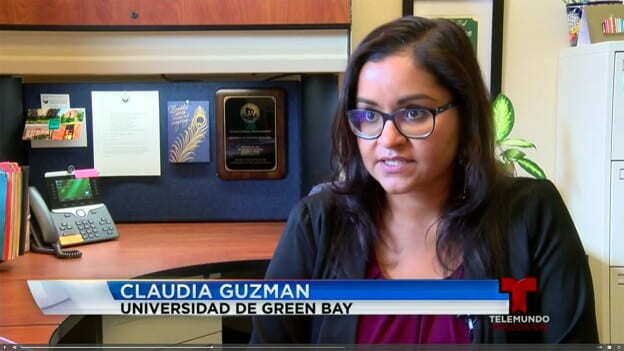 As part of Hispanic Heritage Month, UW-Green Bay Director of Student Life Claudia Guzman was recently interviewed by Telemundo Wisconsin. The story ran Monday (Sept. 24, 2018) and features a video interview with Guzman and lots of shots around the UW-Green Bay campus. See the original piece in Spanish or one passed through an English translation engine (below). Earlier this semester, Madison 365 published a list of Wisconsin’s 32 most powerful Latinos, including Guzman. You can also find it on Channel 3000. GREEN BAY (TELEMUNDO WI) – As part of Hispanic Heritage Month, Telemundo Wisconsin is sharing the stories of Hispanics that stand out in our community. Claudia Guzman is a Latina who works for (UW-Green Bay). Her position is vital to involve Latino students on campus. Originally from Milwaukee, Claudia says that her passion for education is what motivates her in her work, but above all, her family. Guzman is the director of Student Life at the University of Wisconsin-Green Bay. Although she has only been in her position for seven months, she is already part of something bigger on campus. Guzman describes her position as a guide and model for students, especially those who are underrepresented. Originally from Milwaukee, Guzman says her passion for education began at an early age when she knew she wanted to be more in her community and at the same time help people find their identity. But above all, Guzman says that her passion for education began at an early age when she knew she wanted to be more in her community and at the same time help people find their identity and passion. As the daughter of immigrants, she uses this dreamer mentality with her students. It is inspirations like these that Guzman says she hopes to share with her students regardless of their trials and what they would like to become in the future. “I know that what I do is not only for me but for my family, and also for the community,” says Guzman.